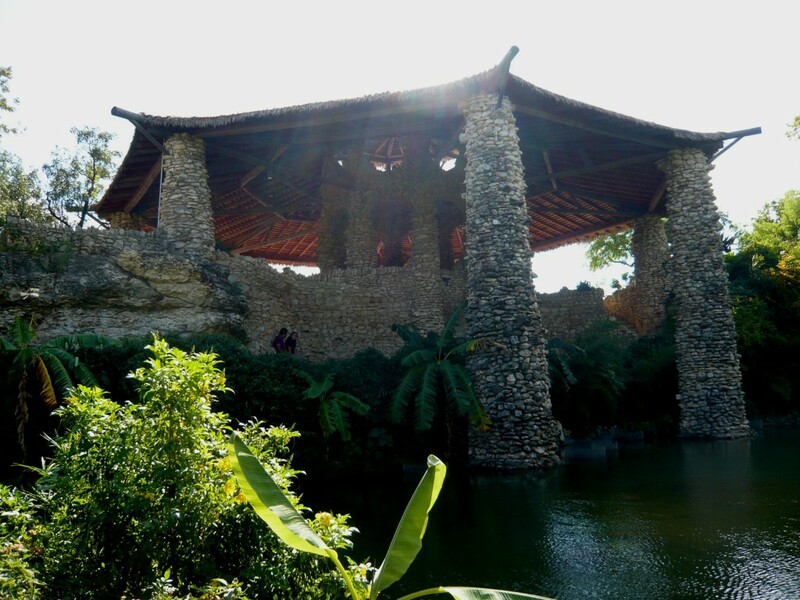 the beautiful stone pavilion at the sunken gardens - memories! As many of you know, I grew up in San Antonio, Texas – a charming little city right in the middle of that big state. There are so many wonderful things to see in this unique place … a famous old Riverwalk, the Alamo and other missions, and some beautifully restored examples of the majestic houses early German settlers built in my old neighborhood, The King William Area. 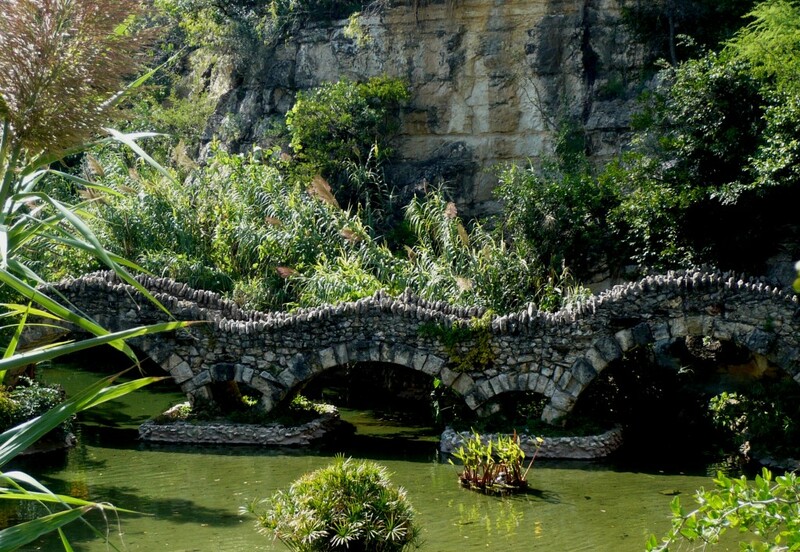 But in my heart of hearts, my hands down favorite place in San Antonio is the Sunken Gardens. this used to be a quarry! what a re-purposing! 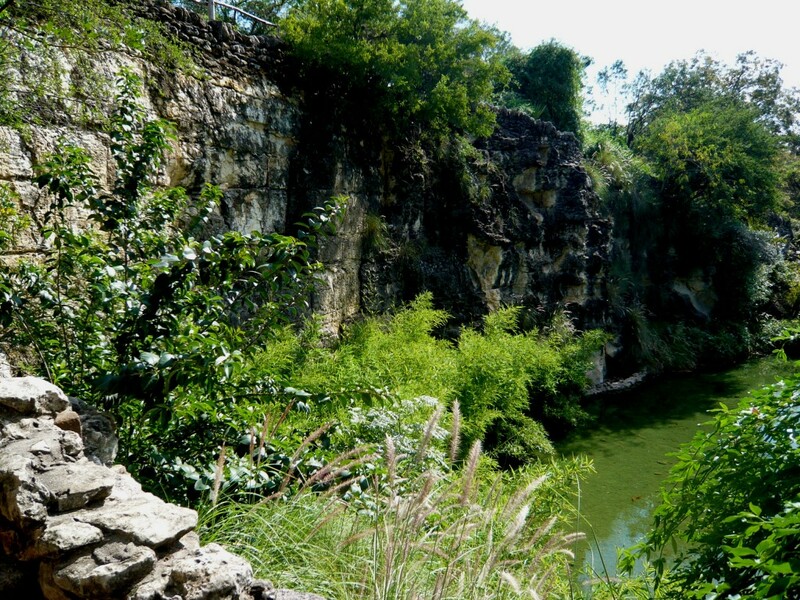 The site of the Sunken Gardens was an old rock quarry donated to the city parks department. The adjacent land was already a large city park, so the idea of turning the quarry into a lily pond was agreed upon – but no funds were available. Prison labor and stone quarried on-site created the rustic hardscape, and the plants were donated from nurseries – some people even brought by their bulbs to help the effort along. The Japanese Tea Garden (although the entry sign says “Chinese Tea Garden” – huh?) was opened in 1918, and has been very much enjoyed. it SAYS chinese, doesn't it? but here on the plaque, and on the signs in the park- japanese! I remember running in the gardens as a little kid, stalking koi, screaming like a … well, like a child, as I careened over the bridges at breakneck speed. The paths were so fun – a puzzle to run through, a maze made of water and stone. my old foes, those dastardly koi! I also have other memories; later – teenaged memories of hanging out in misty twilight, talking with best friends in the pagoda about absolutely everything and laughing until we cried. And I remember times when I was running again, playing hide and seek with a very cute boy. What a perfect place to get lost! What a romantic place to be found! The fact that this space started as a ravaging of the ground, and ended as a way to recuperate it is very inspirational to me. This isn’t the most beautiful garden – the use of plant material isn’t inventive, the hardscape is far from defined and purposeful – but there is so much HEART here. 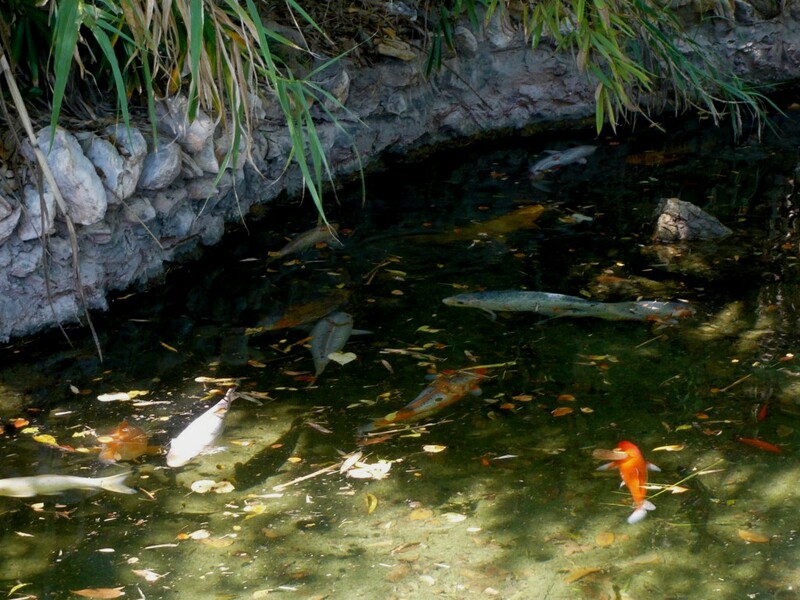 To take a cast off space that usually becomes a garbage dump or a water hazard and turn it into a place for strolling, for first kisses, for teaching children how big a goldfish can grow – that is something I can really get behind! the sheer walls that enfold the sunken garden thrill me! The drama of the rock walls and the stone pavilion rising – pure awesomeness! I love this place. I’ll always love this place. I love the memories of it and I love that it’s still the same. 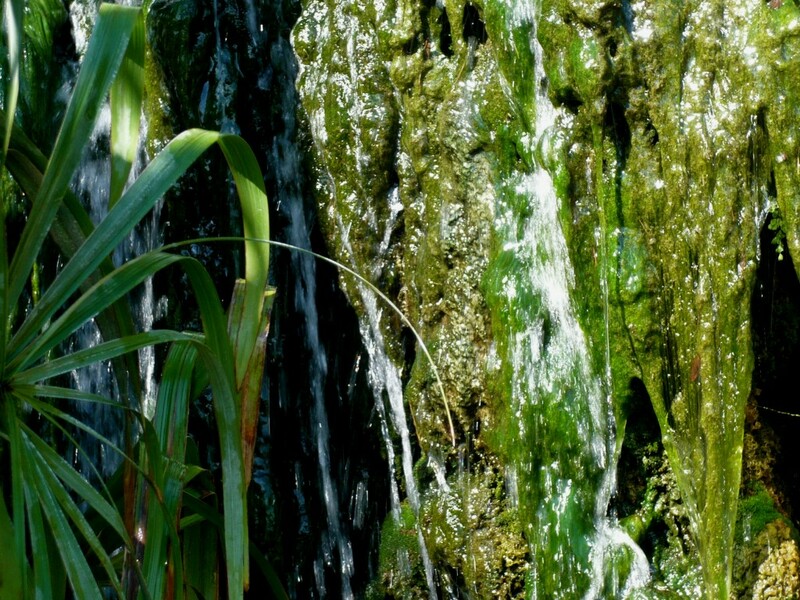 I even love the green water and the arundo! has slime ever looked so pretty? Just another example of how gardens work their ways into our hearts and minds. 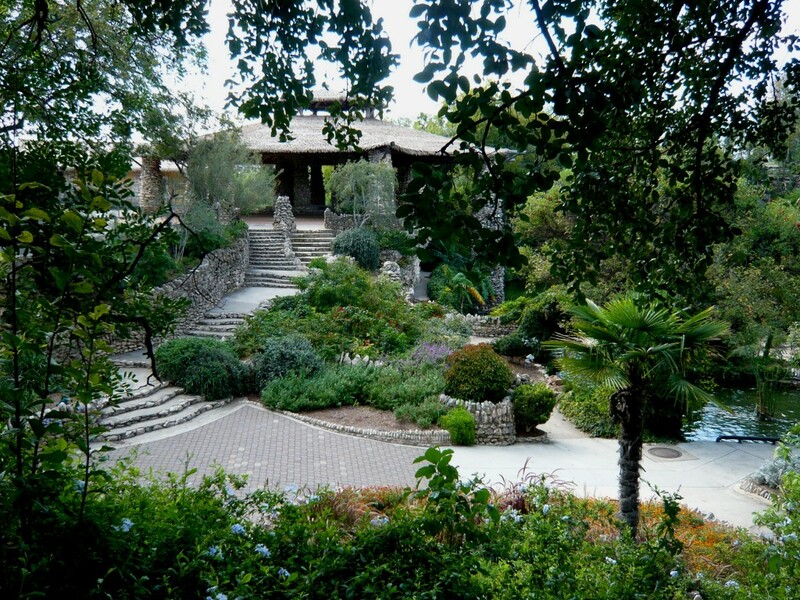 I never imagined that I would be a gardener back when I lived in San Antonio, but my attraction to this place was (and is) keen and persistent – it even shows up in my dreams sometimes. I finally visited San Antonio a few years ago to get together with family in Texas… How could I have missed this!!!! No one told me about the Sunken Gardens, and they all know that gardens are what I’m all about! My research didn’t yield this gem, either. Will I see you in La La land, ma cherie? Could we possibly have been in San Antonio on the same day and not known it?? The Austin bloggers took a road trip to S.A. last Saturday, spending the day at the botanical garden and then the Rose Emporium. We didn’t make it to the Sunken Garden due to lack of time. I’ve seen it once, in college with my sweetheart, and I enjoyed it but wasn’t wowed by it. I’m seeing it anew through your eyes though. Yes, personal memories make all the difference, and you can sure love a garden for those reasons. Kimi Eizo Jingu, a local Japanese-American artist, moved to the garden. In 1926, they opened the Bamboo Room, where light lunches and tea were sold. Kimi and Miyoshi Jingu maintained the gardens, lived in the park, and raised eight children. He died in 1938, and 1941 the family was evicted with the rise of anti-Japanese sentiment of World War II. 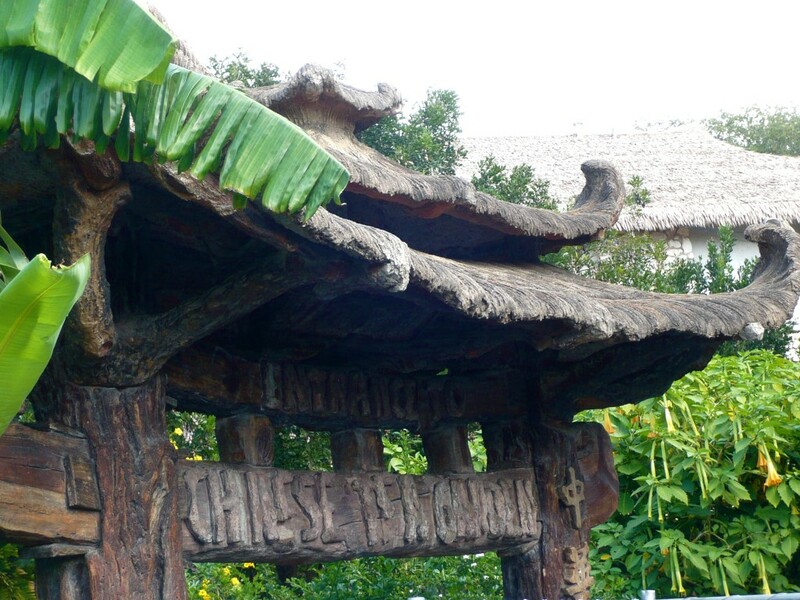 The gardens were renamed the Chinese Tea Gardens, and a Chinese-American family, Ted and Ester Wu, opened a snack bar in the pagoda until the early 1960s. 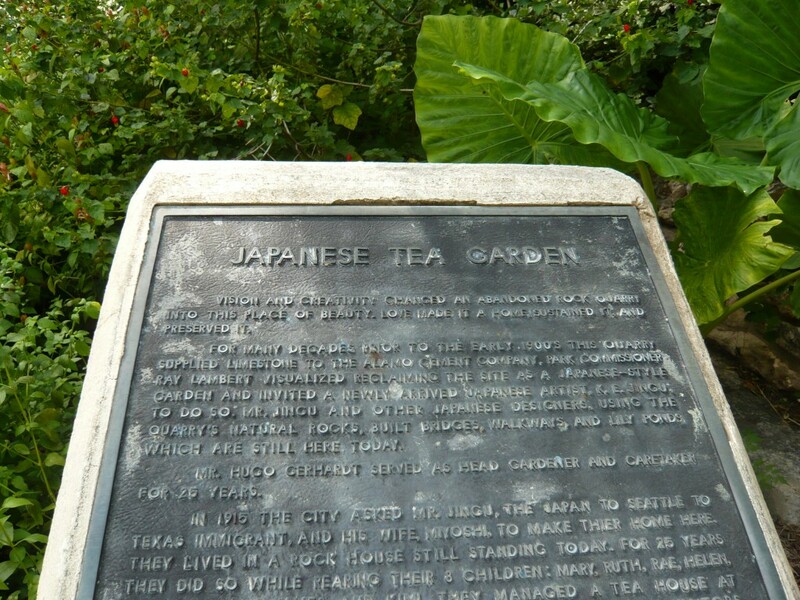 In 1984, under the direction of Mayor Henry Cisneros, the city restored the original “Japanese Tea Garden” designation in a ceremony attended by Jingu’s children and representatives of the Japanese government. This is an absolutely magical place. What a joy it would be to experience it — I can see why this would stay in your memory from childhood. Even in photographs, it’s transporting. Gee, another place to add to my garden must-see list??? I’ll to have to live to be Methuselah, for sure. Lovely post. The pictures combined with your memory telling make it so real. I wish I had seen this on my one and only trip to San Antonio, I guess it means that I’ll have to go back! And since we’ll be there we’ll have to trek to Austin too. Wow….I’m already planning my next vacation and just back from the California one. Thanks for the low-down on the sunken garden! Beautiful spot. Must remember to seek it out next time I’m in San Antonio. Thanx, Germi. 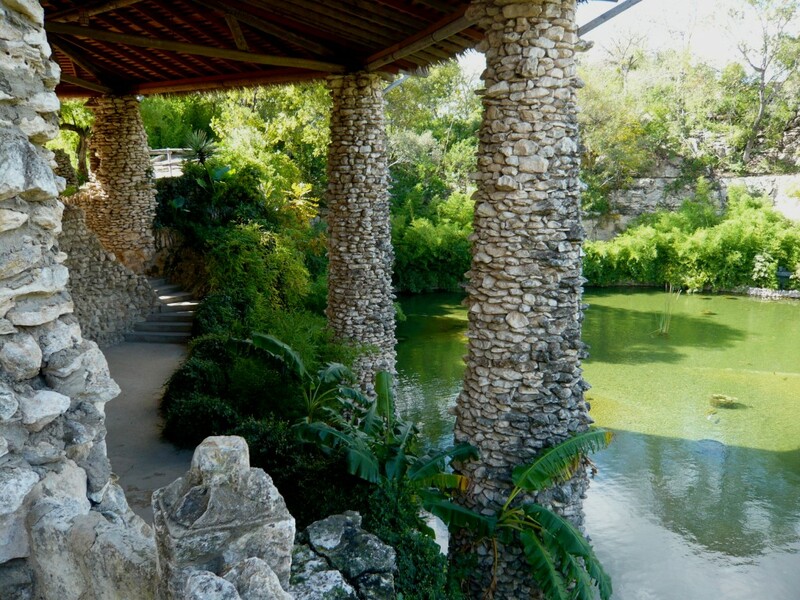 San Antonio is such a nice, relaxing place to visit, and since the Sunken Garden is in the middle of SA’s biggest park and right next door to the Zoo (an air gondola links the two – a very fun ride when I was little!) it is a natural place to visit if you know about it. But it doesn’t suprise me that your garden network might have overlooked it – it really isn’t a garden that would garner special attention unless you were specifically looking for an old quarry that has been turned into a garden! THAT is the cool thing about it – the taking of what was a torn up hole in the ground and making it into a place for the enjoyment and cultural enrichment of the city. The city parks commissioner at the time had the kind of vision we want our public officials to have NOW – to have thought about how to reuse and repurpose the quarry space and integrate it into the park was a fantastic move! And I very much appreciate the elements where you see the quarry – the sheer walls, especially. It is a total art move, as far as I’m concerned. And I know you’d love that! XO! Hey there Pam! WHAT??? In SA at the same time? We are getting closer! Some day our worlds will collide! You are TOTALLY right – the Sunken Garden really isn’t a garden that stands out in a big way when I look at its singular elements- the plantings aren’t especially inspiring, and while the rustic hardscape is nice, it doesn’t wow me (although I love the pavilion). But – it is a place that speaks to a spirit of re-use, and that has given me a life-long attraction to grottos and caves. To me, it is a constructed space that is half garden half wild cave – I LOVE that! One of my favorite posts of yours (of my many many favs – Digging it a wealth of awesomeness!) was the beautiful cave that opened into a pool that was surrounded by woods. 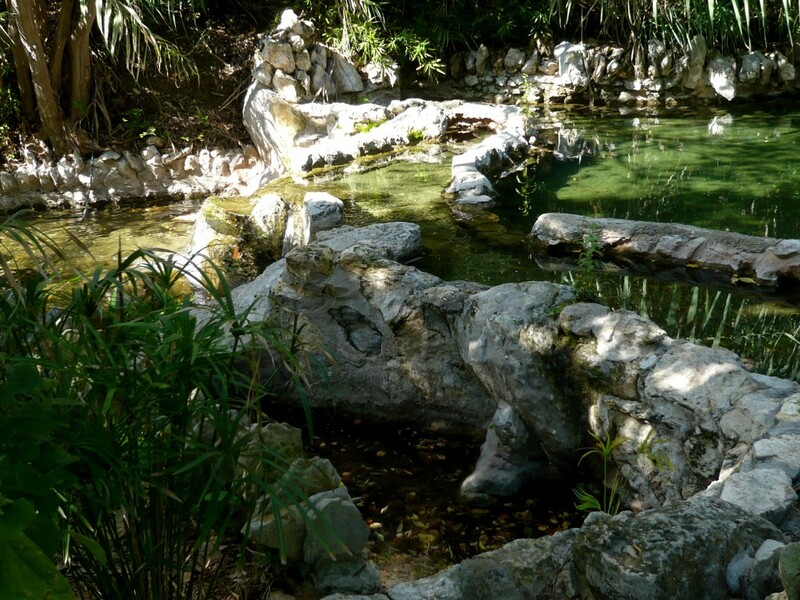 That is complete natural beauty; Sunken Gardens is (I believe) an attempt to capture that same spirit. It doesn’t totally succeed, but it points the way! Gotta love that! Nicole, how awesome is it that you gave us the background! Now it makes sense – it was re-dedicated! I guess I just thought it was some sort of gaff that was passed off back then as “oh well, Chinese, Japanese…” which would be awful, but not unheard of in my old neck of the woods. 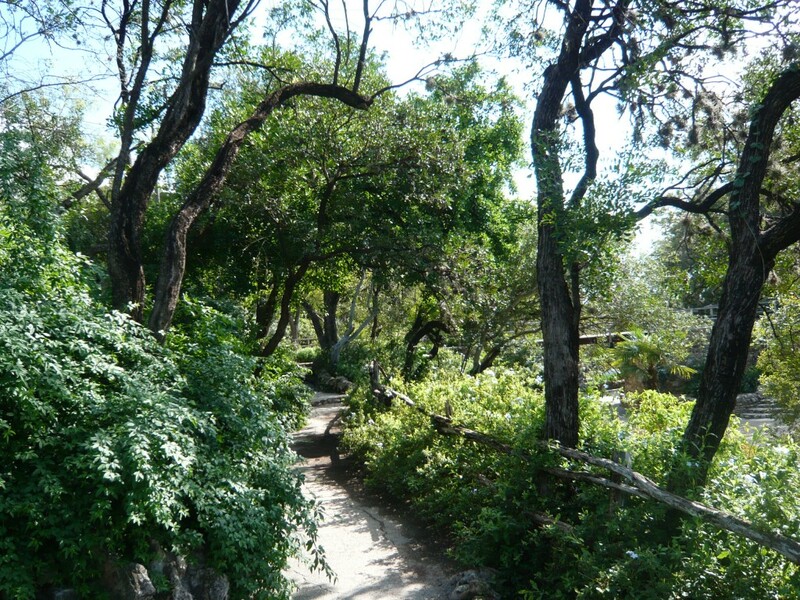 How very sad that the Jingu family were evicted from the gardens – it makes me cringe … and I am so proud that Henry Cisneros (who will ALWAYS be Mayor of SA in my mind) re-instated the original designation of the gardens. Thanks so much for clarifying that for us! Yes, Helen – magical especially at night, because there is so much conceal/reveal that goes on. And like I said, the perfect ‘Hide and Seek’ spot. Aren’t there just TOO many gardens to see?!? I feel exactly like you – how can I do it all? We’ll just have to figure it out! Loree! MORE vacations! MORE!!! A San Antonio/Austin trek would be SO YOU!!! I thought of you so much when I was at The Huntington Gardens this week – I’m doing a post soon full of our pet plants! Always a pleasure to point out cool gardens, Expat dear! But I swear, I find something cool in MOST gardens!